As you represent the whole government, it’s very valid to address this letter to you. You have the responsibility to answer the entire nation or at least the Majority of our national citizens about your government's successful inclusion of the so called 'SAFFRON TERRORISM' phrase. In all these years of thorough investigations, most of the times pre-laced with prejudice and malicious agendas; still your government couldn't manage to prove the cases against Sadhvi Pragya Singh, Col Colnoel Purohith and Swami Aseemananda for the so called nonexistent phenomenon called "SAFFRON TERRORISM"? Don't you think there is a lot of consigned interest, in the manner National Investigation Agency (NIA) was so extra apprehensive to name Sahdvi Pragya Singh and Swami Aseemananda in 2008 Malegoan Blasts? This is very evident that, there is a lot of foul play in the name of secularism and appeasement as for most of your stooges in the government it is maligning Hindus and Hindu sentiments is what stamps them as true seculars. If I can be little sober, it is your government which is in fact trying to snub the majority (read Hindus) of our nation from the day you unfortunately came to the helm in 2004. And the manner in which many of your lieutenants made it a routine affair to spew venom against Hindus for vote bank is for everyone to see. Honestly, we have seen enough hate speech from the so called intellects like Digvijay Singh, Abdul Rahman Antuley to believe them to be stray and individual opinions. When Osama Bin Laden was killed and the body of the moron was thrown into Sea; what Digivjay Singh said is very stupid of him, to say the least. He went on calling Osama as 'Osamaji' and urged the American government to conduct the proper funeral rituals for him. When a person has been declared as a global terrorist and perhaps the main reason for thousands of deaths, a so called ex CM of your party goes ahead painting a messiah out of the rascal is not only flabbergasting but a way lot insane. While as per records the last rights were duly performed, the only reason why his body has been disposed to sea is, nobody in the world should build a memorial for him, as he is considered a Martyr by many from the religion of peace and may be many like Diggy Raja of your party. So, what is the color of terrorism is this one Dr. Singh? When Owaisi called the terrorist KASAV as "Bachcha", what did your government do? Just sent him to judicial custody for few days? Seriously? You may be a lame duck and too power hungry to object but our countrymen want to know from Mr. certain Owaisi is this; a killer, who shot more than 150 people in the name of jihad, looks "Bachcha" to him. I agree, looking at your stature, you don’t even have a say among your own party men, let alone some scoundrel from another party but aren’t your party enjoying an alliance in the Hyderabad municipality corporation with Owaisi’s notorious outfit? Have you even advised the moron to refrain from uttering nonsense that has the potential to hurt a lot of sentiments? Being a senior member of the alliance your behavior in cajoling with the likes of Owais post his blabber is anything but suspicious. Ditto is the case with Yasin Malik. A Thug that he is; he with an Indian VISA went to Pakistan and hobnobbed with another global terrorist and mastermind of 26/11, Hafeez Saeed openly to protest against the hanging of Afzal Guru. What did the government do? You even don’t find the revocation of his VISA a much needed step to teach the moron a lesson or two on patriotism and responsible citizenry. What kind of state sponsored terrorism is this Dr. Singh? Having such brainless maniacs in and around your party, you guys are highlighting the non-existing SAFFRON TERRORISM. If all these blabbers weren’t just enough, this Diggy went a step ahead and termed RSS a terror organization. As a responsible citizen of this nation, I am spellbound at your easy going against terrorism. When you have heap of evidences against the terror organizations like SIMI, AL-QAEDA, HUJI, INDIAN UJAHIDDEEN, you seldom show any interest to act against them but conveniently draw imaginary attributes to fool and misguide the nation. That is so funny, you know? In Samjota Express Blast, there are intelligence reports from both India and America, which says that Lashkar-E-Taiyaba's member Arif Kasmani is involved. Do you remember this report? Does anyone in your party remember the findings? Based on these reports, in 2009, Lashkar has been blacklisted as a terrorist organization. 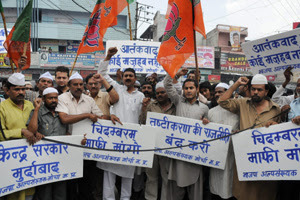 But conviniently looking the other way for vote bank, your government is still chanting the Saffron Terrorism Mantra. Governance and safety for the citizens is not seems to be the primary motto of your government but politicizing terrorism and maligning Hindus is. To say the least you should be ashamed of yourself to represent this government. In 1984, in the name of 'Blue Star' operations, people who supported congress and party workers killed more than 3000 sikhs. Not surprising that the sufferers are yet to get any kind of closure but what surprising was how Rajiv Gandhi justified it back then. “Some riots took place in the country following the murder of Indiraji. Some riots? 3000 got killed in 72 hours and that too in the capital and our PM just washes it off by saying ‘Some Riots’? What does such insensitive comments justify Dr. Singh? Obliviousness or accomplishment? And what is that ‘Big Tree Falls’ nonsense? How dearly I want some elitist Congress men to come forward and explain the meaning of such horrendous comments to us lesser mortals. Anyway, back to the topic. Let’s concentrate on the saffron terrorism. Can anyone from the government or its investigative wings ever found any concrete evidence against the Hindu group/s that you guys are accusing of treason and involved in terror activities? Whether you remember or not, but the former chief advisor of National Security Group (NSG), now the Governor of West Bengal state, M.K.NARAYAN said once; there are more than 800 terrorist organizations operating in the country. Have you ever worked on these scary inputs of former NSG chief? Or at least can you point out; out of these 800 odd which one is a saffron terror outfit? Unfortunately our former Home Minister, don't know what is saffron and its importance to Indians. We proudly represent saffron as one of the colors in our national flag. Have you or your stooges cared to know why? It is to represent our nation's pride, power and purity. We citizen of India always believed in UNITY IN DIVERSITY and will continue to do so but you guys are sabotaging it by creating 'DIVIDE’ among the citizens in the name of religion. But surprising enough, rather looking within you guys go ahead blaming the rest of the world for playing religion based politics. So funny, I tell you. With all honesty, you are no more than a puppet for me. You may be the priminister of India, but I can clearly say that; you have been just used as a tool to fulfill the congress agenda and nothing else. Hope you ponder on this revelation when you are free from taking dictations from 10 Janpath, Italy or wherever. Operation 'Blue Star' was name given to the operation to flush out terrorists holed in the Golden Temple during which parts of the temple were damaged and which supposedly lead to assassination of Indira Gandhi.. Apart from this 'Blue Star' bears no relation to the 1984 riots that followed..
boy blue star led to assasination which let to genocide , so use ur abstract thinking if u r more than 10yrs old..